Excerpt of article originally published under the title, "Turkey's Rambos (Almost) Fight Islamic State." 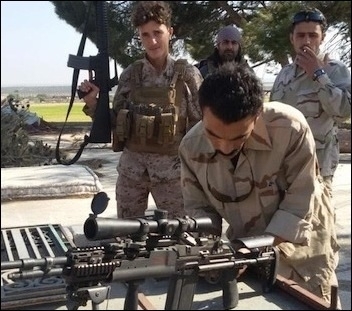 A photo recently uploaded to Twitter shows Division 30 fighters with a U.S.-made Mark 14 Enhanced Battle Rifle. Last year, the half-hearted Turks and wholehearted Americans sat down to understand where in the Syrian civil war they converged and diverged. The Americans viewed the Islamic State (IS) as their number one enemy. After having destroyed the jihadists, we could sit down and talk about Syria's future, including the departure of Syrian President Bashar al-Assad, Erdogan's top regional nemesis. In contrast, the Turks would reluctantly help fight IS but insisted that if peace were going to return to Syria, Assad had to go. After months-long negotiations, the two NATO allies in February signed an agreement to train and equip moderate rebels who would fight both IS and Assad. Groups of opposition fighters would be trained at military camps in Turkey, Jordan, Saudi Arabia and Qatar. They would be ready to fight and finish off the Islamic State. The Pentagon even identified 1,200 fighters for training. They believed that eventually the allies would train and equip about 5,000 fighters. Then the program largely disappeared from the public domain. Officials cited security concerns, for secrecy about where and how many fighters were being trained, and with what gear they were being equipped. Finally, in August, the Rambos trained and equipped by Turkey and the U.S. came to the public attention -- if not quite in Rambo fashion. The dramatic end of Division 30 shows that the U.S. and Turkey have major human and military intelligence problems in Syria. On July 13 (or July 12, according to different sources) a team of 54 fighters trained and equipped by Turkey and the U.S., and known by the fancy military name Division 30, secretly entered Syrian territory -- meant to blaze a trail for others who would fight IS and (later, perhaps) Assad. 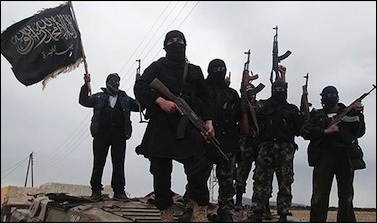 Shortly after entering Syria, the al-Nusra Front (ANF), an al-Qaeda franchise, abducted the group's leader, Nedim al Hassan, together with 17 fighters, in northern Syria. The next day ANF attacked the team's headquarters near Aleppo, killing five fighters and injuring 16. In the same attack, eight more fighters were abducted by ANF forces. The remaining seven fighters took refuge in a Kurdish-controlled town in northern Syria. Division 30's guns and equipment were seized by the ANF, which later released a video showing the hostages who were supposed to fight IS. In the video, one of the detained fighters tells the camera he was recruited by the U.S., through intermediaries, to receive training in Turkey for a month and a half. He says the trainees were each given an M16 assault rifle and some cash, and sent to fight ANF in Syria. An ANF member said his group "cut the hand of the West and the Americans in Syria" by capturing the fighters. The Free Syrian Army, which Turkey supports in the hope that it may help Ankara topple Assad, is now in talks with the ANF for the release of the captured fighters. . This is not the first time the al-Nusra Front has made mincemeat of U.S.-supplied rebel forces. The tragic failure of Division 30 even to start any fighting underlines a few disturbing facts. First, although this was the first U.S./Turkish-trained force officially sent to Syria that faced a tragic end, it is not the first group of fighters that failed. Last November, two of the main rebel groups (Harakat Hazm and the Syrian Revolutionary Front) receiving U.S. arms to fight both IS and Assad, surrendered to the ANF. They had even been given Grad truck-mounted rockets and TOW anti-tank missiles. Apparently, the U.S./Turkish-backed groups lack the military capabilities and tactics that, together with allied air support, would have helped them win control over strategic towns. Among dozens of different groups fighting in northern Syria, the Kurds and various jihadist bands know the area best. Second, the dramatic end of Division 30 has shown that there are both U.S. and Turkish human (and military) intelligence weaknesses regarding the war zone. Third, without a credible ground operation (and scores of fallen soldiers), jihadists cannot be seriously fought. For such an unpleasant venture, both the US and Turkey are too unprepared and reluctant -- for understandable reasons. Fourth, Turkey's leaders, who do not hide their obsession with Assad's downfall, are still daydreaming. On August 3, Erdogan said that Russian President Vladimir Putin has changed his stance on the ongoing crisis in Syria and is "much more positive" about a future without Assad. Erdogan said: "Actually, I believe that he may give up on Assad." There is no means to know how much laughter this may have caused at the Kremlin. But we know that the Turkish obsession with Assad causes strategic blindness and may further weaken an already difficult allied war on the jihadists. Division 30 was a tragicomic start to a ground warfare campaign against the Islamic State and several other jihadist groups. It may not be the last.